I just adore making wreaths! They are such a fun way to add a little holiday or seasonal decoration to your home. I usually have at least three or four up in the house at a time. Front door, back door, mantel and more – no place is safe! 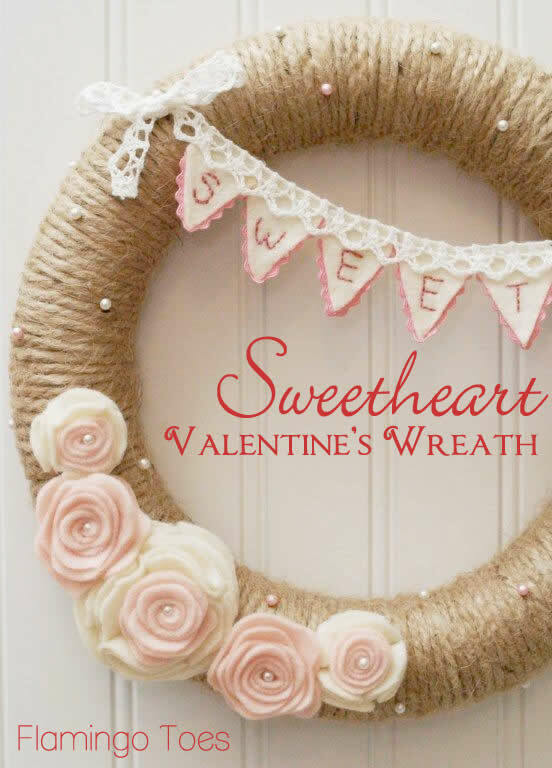 This sweet little Hearts and Lovebirds Valentine’s Day Wreath is up over my mantel and I think I might even leave it up for Spring. The little lovebirds would work for that too don’t you think? I’m kind of on a pastel kick so I’ve decorated this in shades of turquoise and pink – and of course I’ve added pom poms and a pennant. I seem to think no wreath is complete without them. 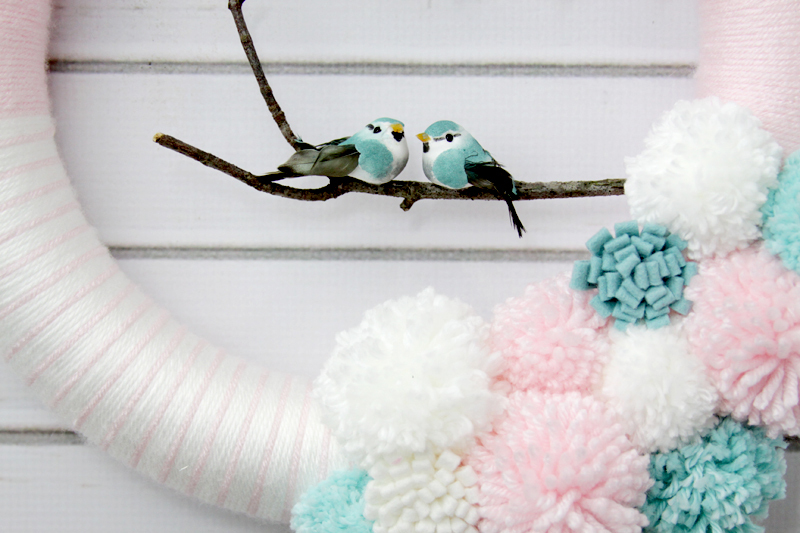 How sweet are these little lovebirds?? I think they are so darling sitting on their little branch. 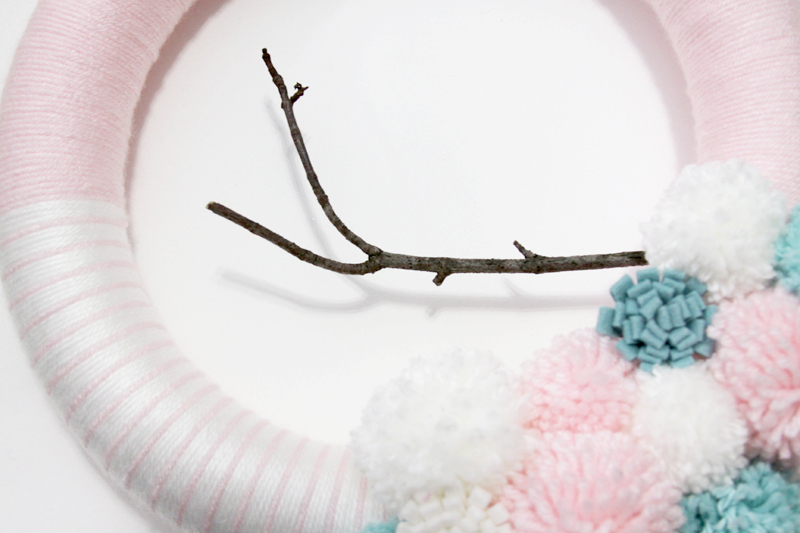 Begin by wrapping the bottom section of your wreath with white and pink yarn. 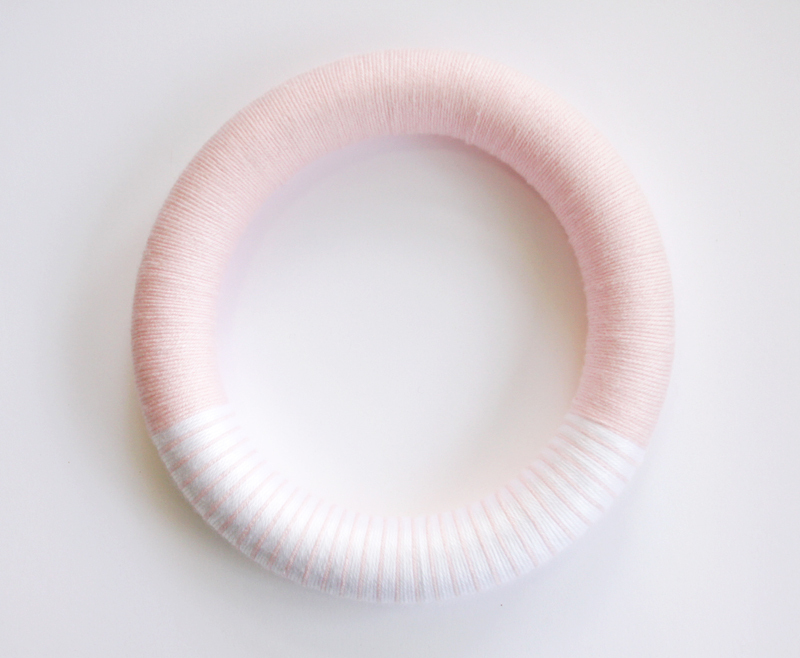 I wrapped the foam with white, then added in a pink stripe after every four white wraps. Wrap just under half of the wreath. 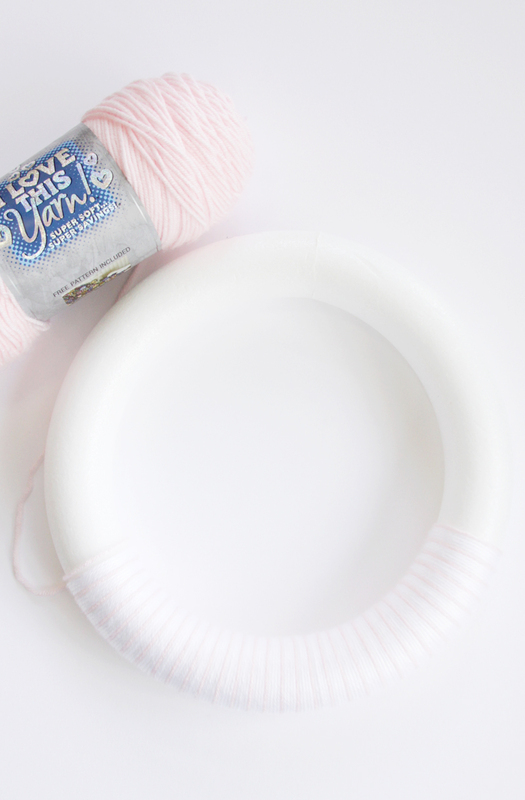 Finish wrapping your wreath with just the pink yarn. Glue down all the yarn ends on the back side of the foam. 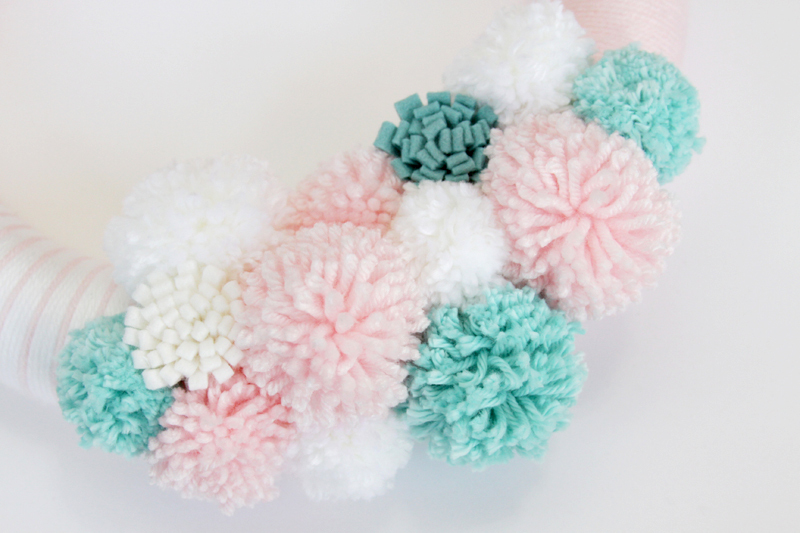 Create an assortment of pom poms in all three colors of yarn. Add in a couple felt flowers for some texture. 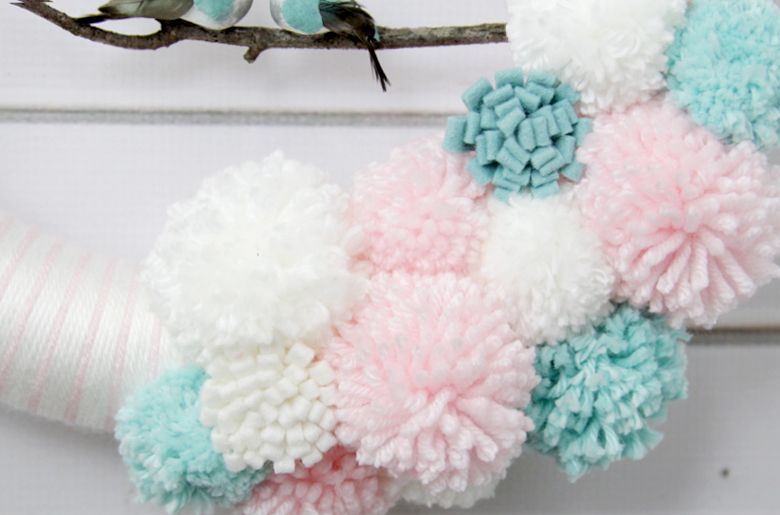 Pin or glue the pom poms along the bottom right quarter of the wreath. 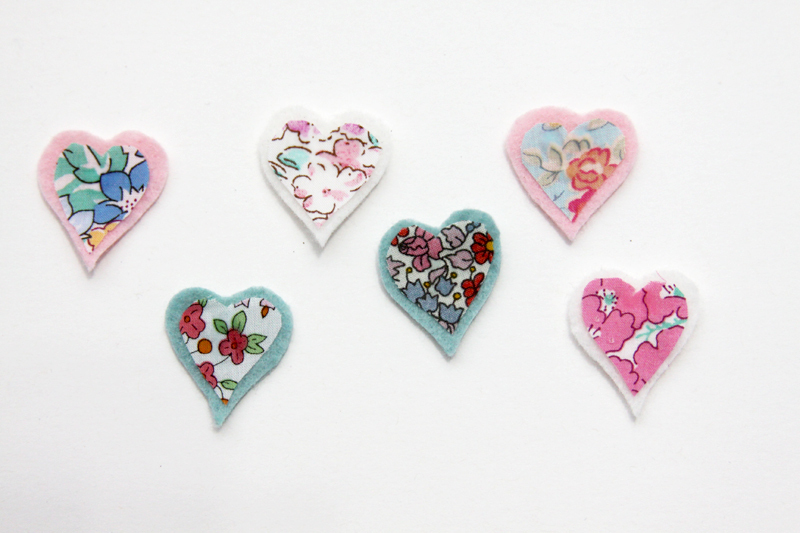 Cut out 6 small felt hearts and 6 scraps of fabric a little smaller than the felt. Glue the fabric on top of the felt. Glue the hearts along a piece of baker’s twine. Check your layout on your wreath form before you do. If you’re using a really large form, you might want more space or even more hearts. Find a small twig that will work for your wreath. 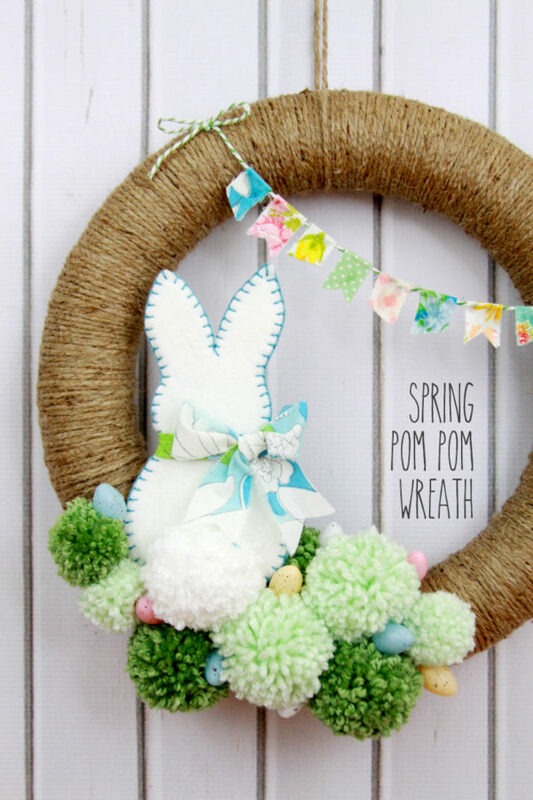 Poke a small hole in the foam of the wreath behind the pom poms on the middle, right side. Pull the twig back out, add hot glue to the end, and put the twig back in the hole. 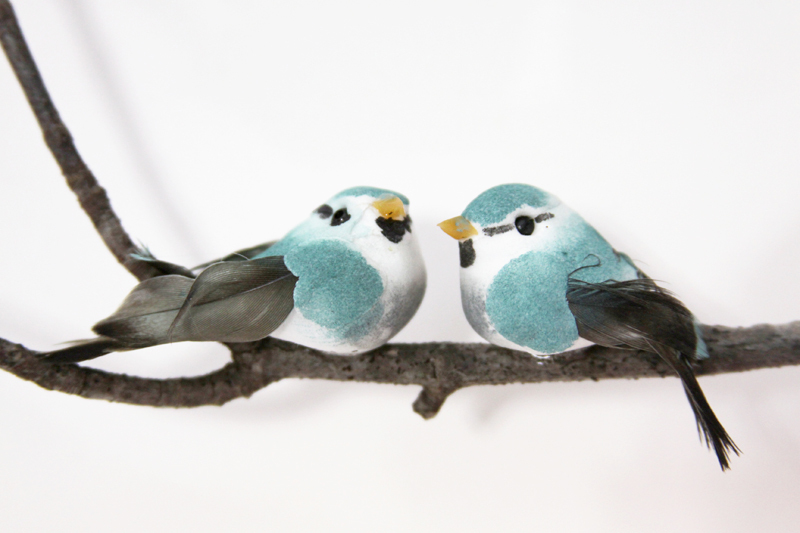 Glue your little lovebirds in place on the twig. Awwwww! 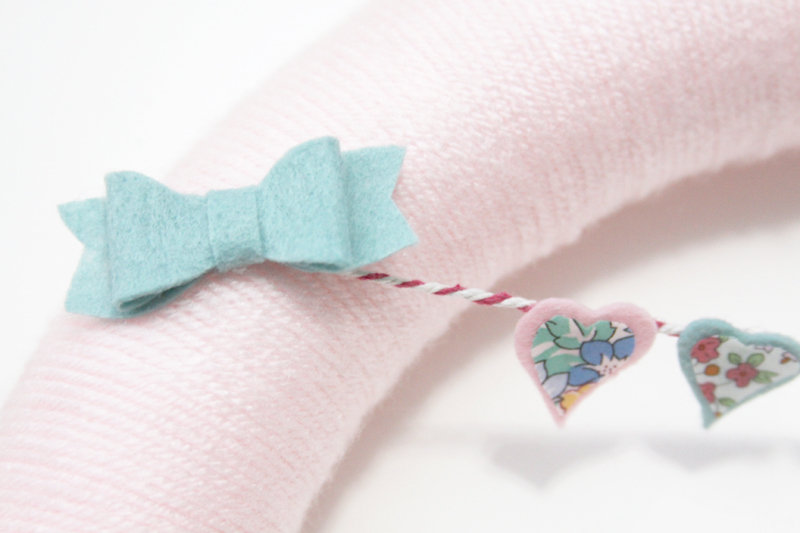 Create mini felt bows for each side of the bunting. Glue the bow and baker’s twine in place on the sides of the wreath. And that’s it! I love how sweet it turned out! So sweet right? I’d love to see your version if you make one up! I just love this wreath! I will start collecting what I need to make it. The love birds will be the hardest thing to find. I will send you a photo when it is done – hopefully before this Valentine’s day. Love your work very much. Thank you for the pattern. 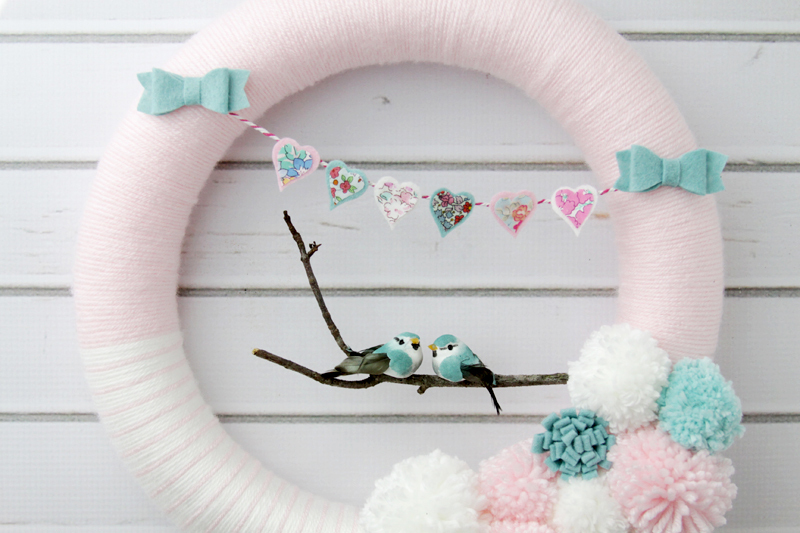 What a cute Valentine wreath, the garland is darling! This is just so adorable…….love the birds. Would look great in a little girl’s nursery too! This wreath is so cute. I love the banner and the Lovebirds. This is very beatiful! Thanks for share with us! sweeter than sweet Bev! thanks for sharing on craft schooling Sunday! What a gorgeous wreath I love it! Sharing on FB & Pinned. Thanks for linking up at #MerryMonday! I honestly think that’s the cutest craft item that I have ever seen in my life. I can’t get over how perfect it is. Seriously. OMG you did such a wonderful job! Love love love love love this!!!!! Love this wreath. The yarn looks so pretty that way and your pom poms are adorable. Adorable! 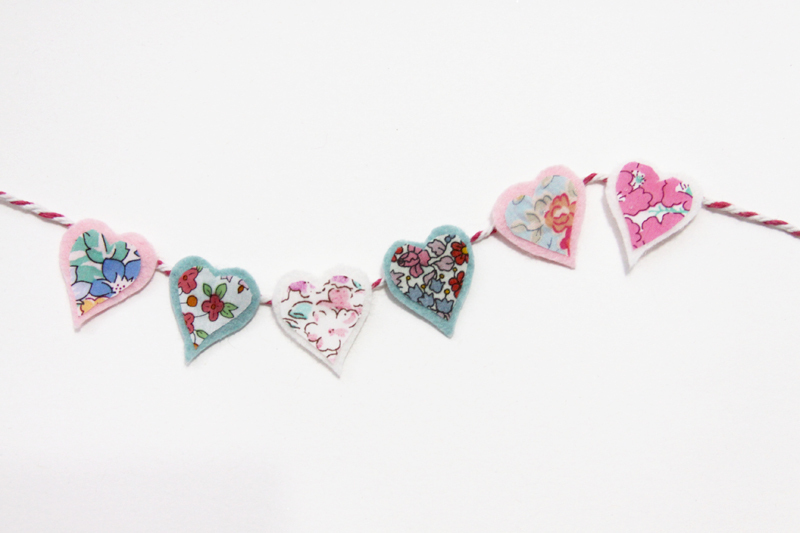 You cannot imagine how much I want to make tiny cute felt and fabric bunting right now! This so sweet! I love it! Too cute!! Definitely on my project list! This is so soft and pretty, thank you for the inspiration. Such a sweet wreath. I love all the different elements that make it so interesting. Ooo ooo ooo! I think this is a maker for me! One question: how do you put together the felt flowers? This wreath is just perfect, I absolutely love it. It stands out with the blues. Pinning and sharing. 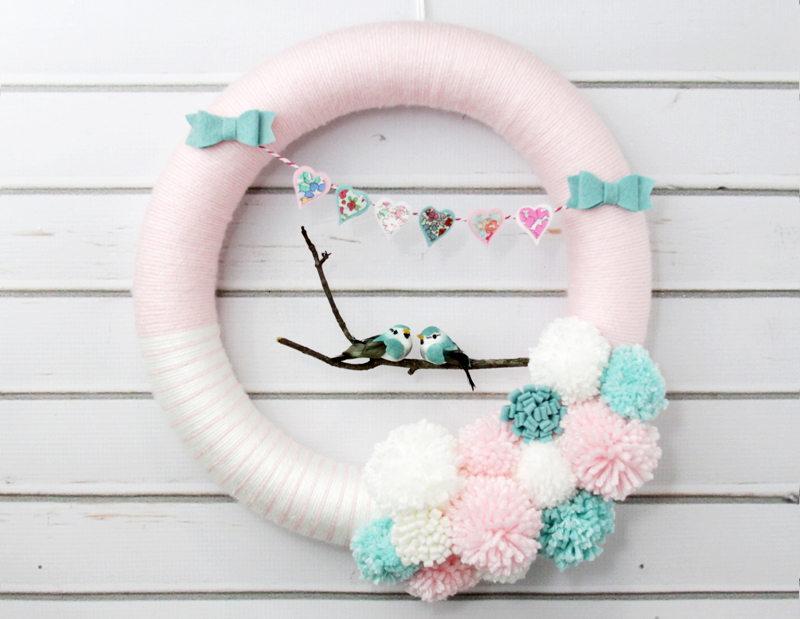 The soft colors in this wreath are so nice. You are very creative and talented! Pinning! 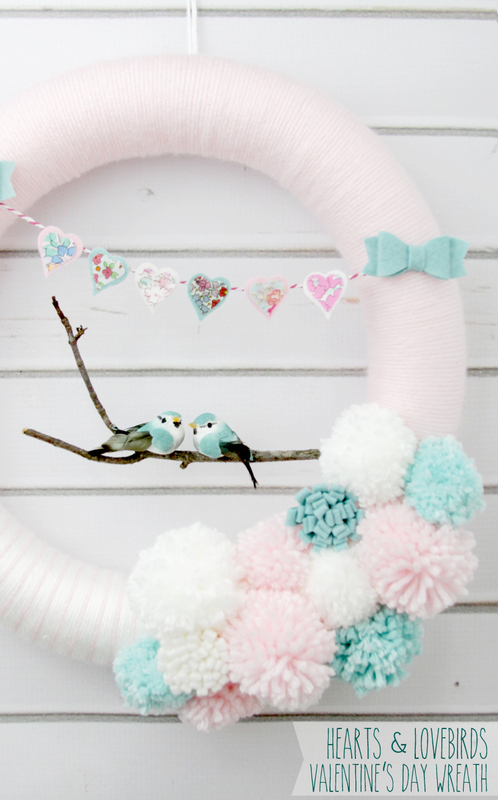 I love the color combination, your wreath is so cute with the love birds!! Hope you will stop by and share on Friday Features this week! 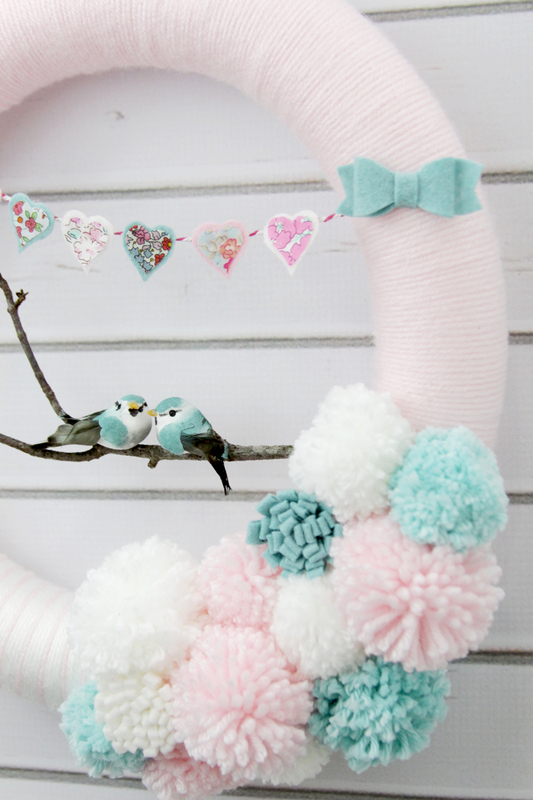 Super sweet lovebird wreath, Bev! So pretty and sweet! The perfect color combination. I love it! 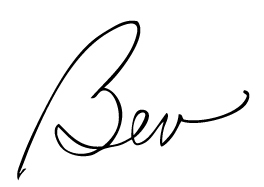 Such a sweet and adorable wreath Bev. Thank you for sharing at Create, Bake, Grow & Gather this week. I’m delighted to be featuring it at tonight’s party on Shabby Art Boutique and pinning too! These are adorable, I love the pale spring colors you used. I’m visiting from Dream Create Inspire today and I invite you to stop by on Thursday and share your post at the TFT link party too. Hugs!